Manchester United fans will be hoping Antonio Valencia isn’t sticking around next season to take on Chelsea’s incoming signing Christian Pulisic. 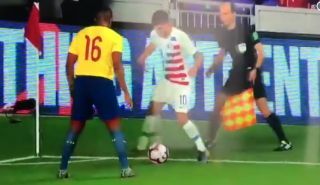 The USA international will be joining the Blues from Borussia Dortmund in the summer, and this video clip below shows just what a threat he is on the wing. In this short but excellent clip, Pulisic shows great feet as he toys with Valencia, before then beating the Ecuador international with a lovely burst of pace. If these two do end up facing each other in the Premier League, one imagines it would be a bit of a blood bath…and not one Valencia would come out well from.